Saturday September 16 1911 Rob came out in the buggy and Ida took her things and went with him. She is going to North Henderson today. Mary Woolf came out for the day. Cora came at 5.30 and Rob an hour later. Cora & I sat up till he came out on the last car. Sunday September 17 1911 Will got home last night and got out on the 8.30 car. Cora & Rob went home. We visited about [Delmar?] and I wrote and rested some. a warm day for the time of year. Monday September 18 1911 I was busy about the house all forenoon. Will & I drove down home in the afternoon. visited with Hattie. We came back [illegible] George Stevens to see the baby & folks. Tuesday September 19 1911 Will helped me do a big washing. I did some mending in afternoon and visited with Mary Woolf Will [priced the plow?] to Art Jones this afternoon. a fine day. 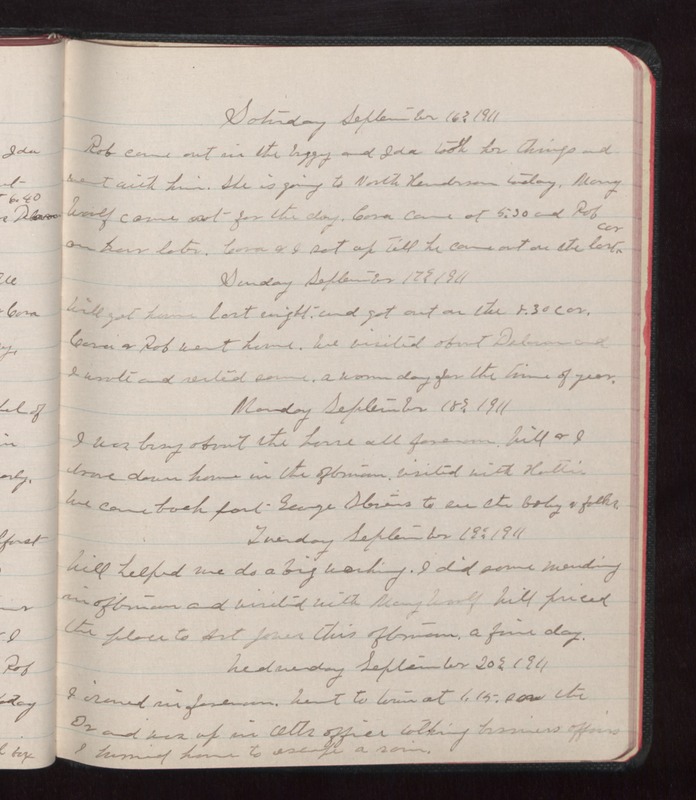 Wednesday September 20 1911 I ironed in forenoon. Went to town at 1.15 saw the Dr and was up in Otts office talking business affairs I hurried home to escape a rain.